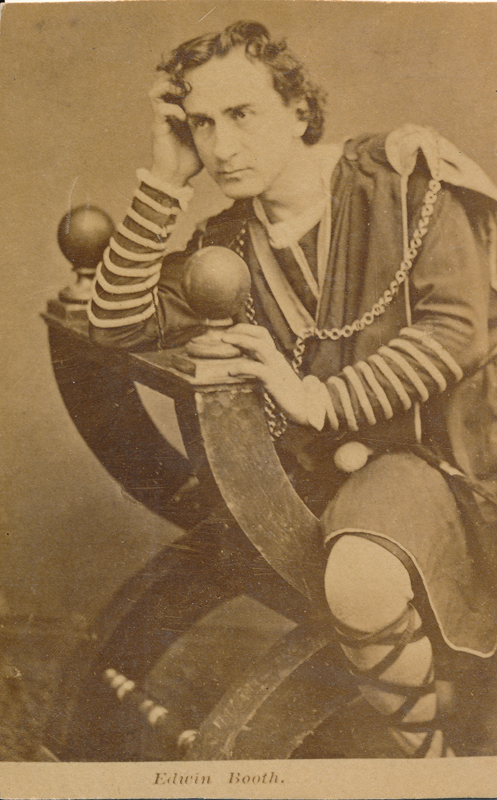 Edwin Booth as Hamlet. This sepia image depicts a man sitting on a chair slouching over to the left with his head in his hand. We welcome your interest in including our work in your research. If you wish to view the postcard images up close, or use them in some other way not mentioned here, please begin by contacting us using the contact form on this site. The physical postcard collection is owned by Dr. Harry Rusche and Emory University Libraries. Shakespeare & the Players, hosted by Emory Center for Digital Scholarship, invites users and researchers to use images and text for private study, educational and scholarly purposes. As far as we know, there are no known copyright restrictions for the images posted to our site, or the physical materials displayed in the images. Your re-use of any image beyond a fair use as codified in section 107 of US Copyright Law or other applicable privilege is at your own risk. It is your sole responsibility to investigate the copyright status of an image and obtain permission when needed. If you would like to use images or texts from the site, please remember to cite us. also, contact us for full-size high definition images. [Identification of item], Shakespeare and the Players, Center for Digital Scholarship, Emory University. The synopses of the plays (on each play page) are taken from the Folger Shakespeare Library with permission to reproduce. If you would like to use any of the excellent text from these synopses, please contact and cite the Folger Shakespeare Library. All other text and content across the site is originally written for Shakespeare & the Players by Justin Shaw and Harry Rusche unless otherwise cited. We always welcome new information about our postcards and the players in the collection. If you have any information that may be valuable for educational purposes, please don’t hesitate to let us know. All personal information (i.e. email addresses) provided on these pages will be kept confidential and will only be used if we need to follow up with you unless otherwise indicated in the contact forms. Also, find out more here about opportunities for teaching and research with Shakespeare & the Players.